Somewhere along the line, you’ve been taught some version of this: Your quiet time with God is only effective when you have the perfect atmosphere, the proper tools, and the right formula. You must rise before dawn, gather your study Bible, devotional book, concordance, highlighters, colored pencils, and journal and devote thirty minutes of undisturbed silence to communicate with the Lord. If you cannot do this every day without fail, you must not love Jesus. 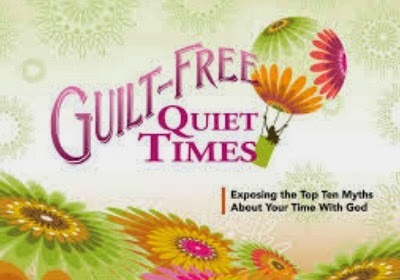 When it comes to your quiet time, it’s time to say no to someone else’s rules or magic formulas that work perfectly for him or her but only create chaos and guilt in your own life. With the perfect blend of sarcasm and Scripture, Emily Ryan exposes the most common myths about traditional quiet times and gives you the freedom you need to chase after God in your own unique way. The book includes small group discussion questions and an exhaustive list of practical ideas that will help you get to know God rather than get to know how to have the perfect quiet time. it’s worth it because He is worth it. You will never regret the minutes you spend on your knees. You will never wish you had read your Bible less. You will never feel as though you’ve sacrificed more than you’ve received.